Purchasing pieces to emulate an outfit I liked has resulted in varying degrees of success in terms of selecting versatile additions to my wardrobe. I often seek inspiration from popular posters on both Instagram and Style Forum, as many of us do. Earlier in my journey into building a classic menswear wardrobe, I didn’t have the contextual awareness that would allow for a well thought out review of how an item I liked might actually be used with what I already owned. Sadly, this resulted in a number of items that hung in my closet mostly unused. There have been a few pieces that have become a part of the regular rotation, mostly through dumb luck, until I started to develop a plan for what I was trying to build in terms of a versatile wardrobe. It’s interesting to me to go through this review process. Looking at the two images side by side, I really prefer the shade of yellow-orange on Alex’s tie much more than the peach-orange of the tie I bought. The scale of the medallions on my tie is also larger than I would like. I think the first time I wore it was after at least 6-8 months of it hanging in my closet unused. 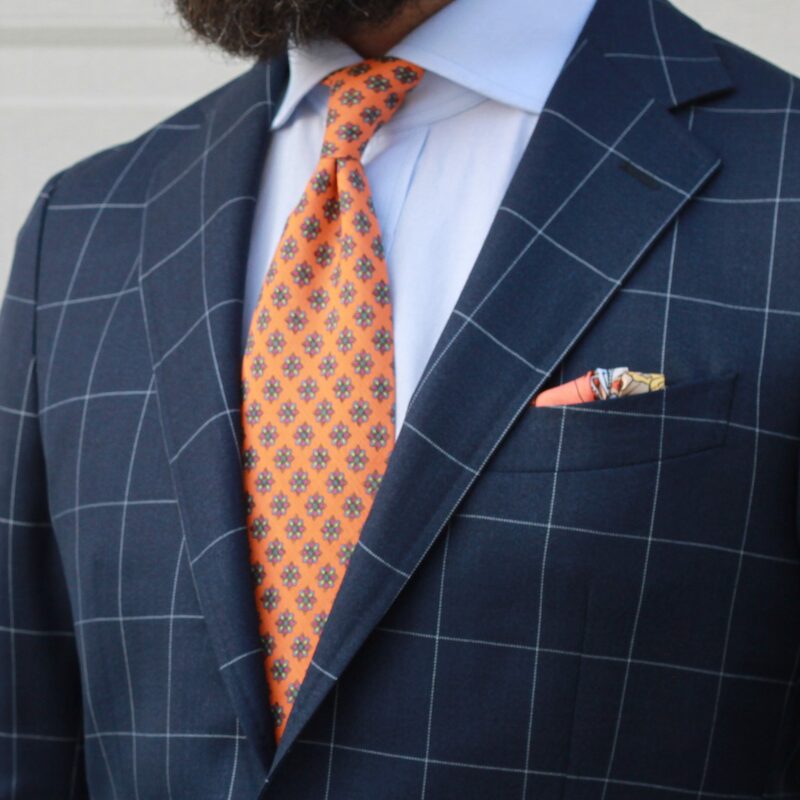 When I purchased this tie, I had a very limited selection of sport coats, which makes it extra challenging: I don’t think a large scale pattern in this set of colours pairs very well with a sober navy or grey suit. It would be too loud. 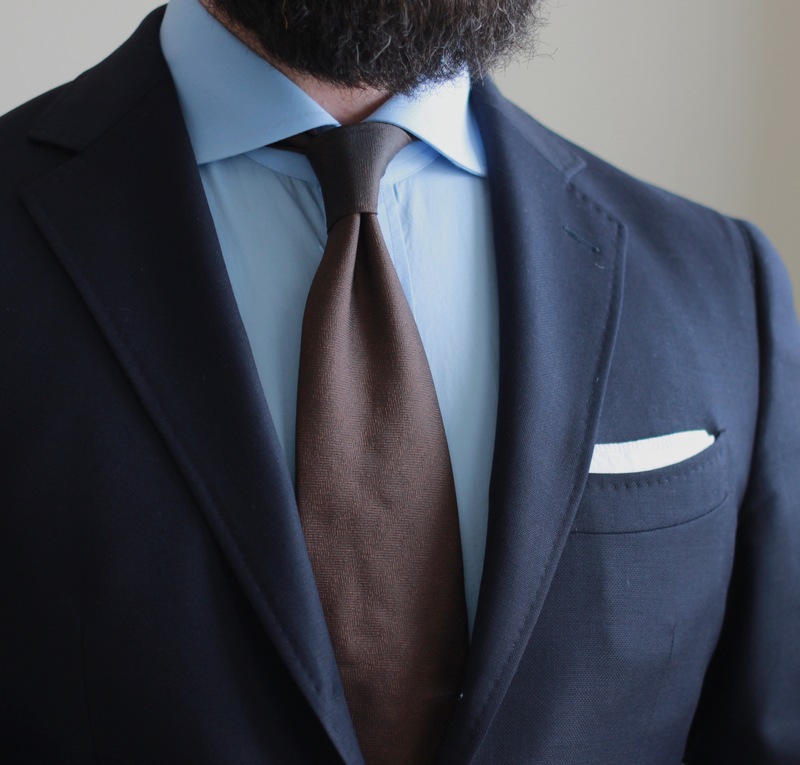 I’ve also come to the conclusion that I generally prefer textured solid ties, though I will wear the odd block stripe or neat. Fortunately, I didn’t spend all that much on this tie, and I like how I was able to pair it with the blue windowpane jacket. So for now, it hangs, waiting for me to reach out and attempt to pair it again. Maybe in the spring/summer. I’m not sure if I’m able to pinpoint the outfit(s) I was hoping to emulate with this purchase. I think it started with this thread over at Style Forum. It’s full of some great, basic combinations based around sport coats. There are a number of looks I wanted to emulate, but once I bought the sport coat it hung un-worn in my closet for a while. I wasn’t really sure how to use it. Fortunately I was able to figure it out, and it’s now in regular rotation. 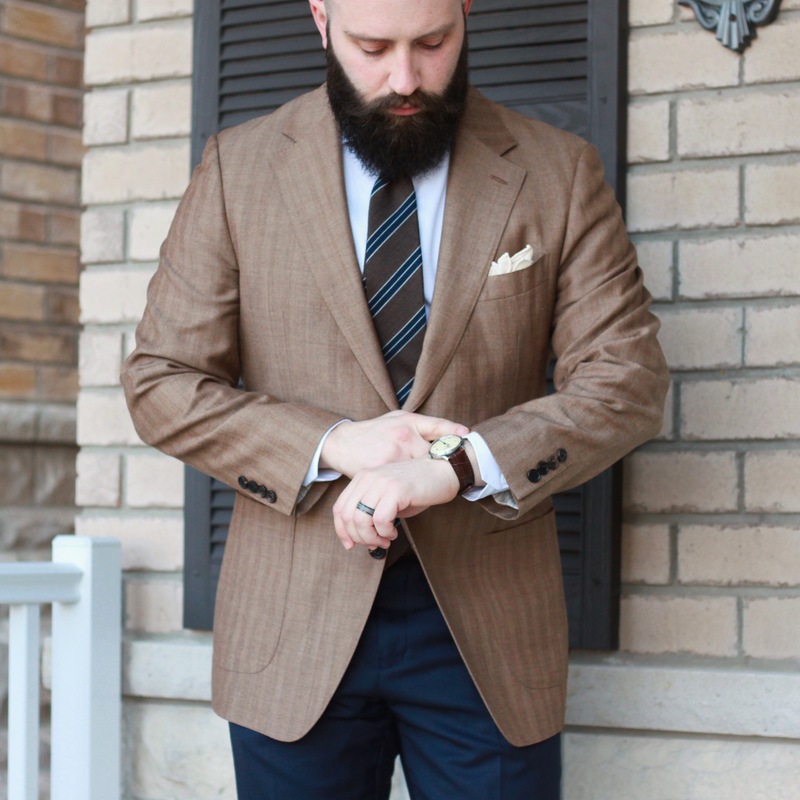 Brown and herringbone seem to be tough for me! I’m a big fan of TweedyProf – both for his style, but maybe more so for his academic approach to clothing. 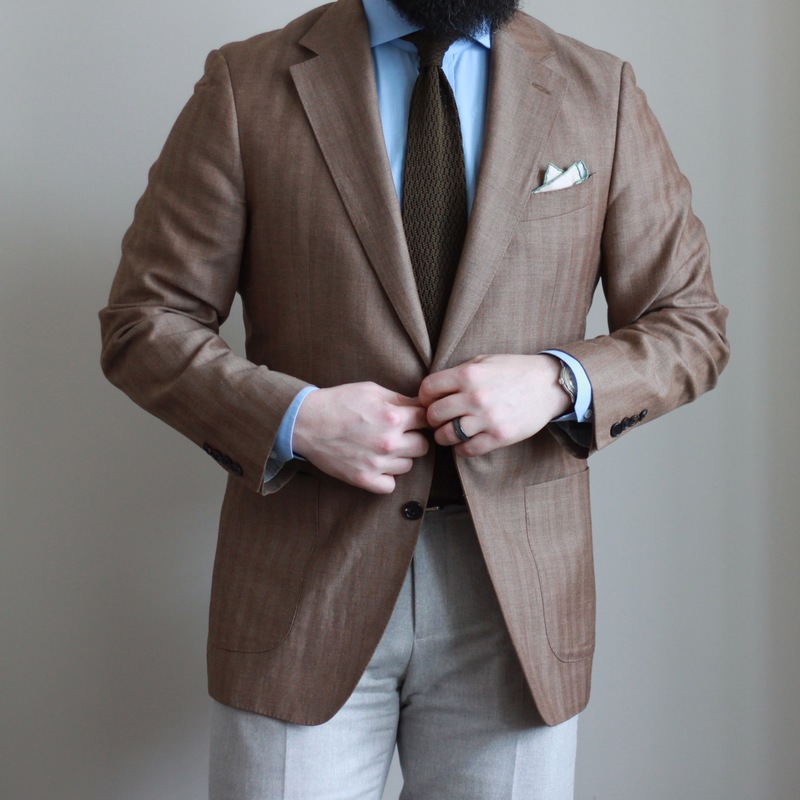 I’ve seen him wear a beautiful cashmere herringbone tie in a brown and caramel tone from EG Capelli, and when I found this one from LuxeSwap, I thought it would do the trick. Initially, it did. Now that I’ve got a bit more experience under my belt (see my #menswear learnings here), I know it’s not really what I want. While I’ve learned to use what I have, you can clearly see the vast difference in texture and visual interest. The one I’ve got it also a much darker brown than I would prefer – think bitter dark chocolate vs creamy milk chocolate. Have you ever bought a piece to emulate a look you admired? How has it worked out for you? Let me know!